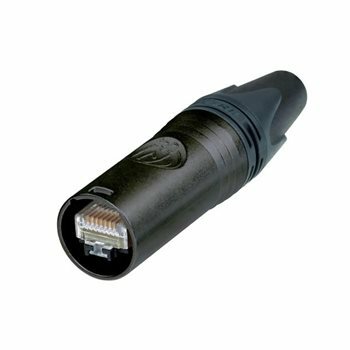 The set NE8MX6 includes a cable plug carrier offering a robust metal shell, proven Neutrik chuck-type strain relief and a CAT6ARJ45 plug. The set is suitable for a cable diameter range of 7 mm to 9.5 mm and gauge of AWG 27 to 22 solid or stranded wire. This self-termination version is water protected according to IP65.